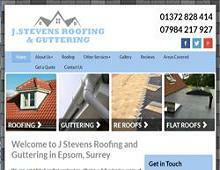 J Stevens Roofing & Guttering are a local roofer in Epsom specialising in both domestic and commercial roofing services throughout Surrey. The Surrey roofing company have many years of experience and operate within a 30-mile radius of Epsom. No job is too big or too small for their experienced, multiskilled roofers in Epsom! From a new pitched roof to repairs to your flat roof the team at J Stevens Roofing & Guttering can help, they can also carry out general building work. If you need a reliable roofing company in Epsom, Croydon or Surrey for your home or business just contact J Stevens Roofing & Guttering, they will be happy to help with your new roof, roof repairs, roof maintenance or guttering.